On October 16th, a celebration was held on top of the just-completed Hoover Dam Bypass bridge. Cars were not allowed, and pedestrians were bused in to take part in the celebration. The bridge is not officially open for transportation, but it is finished. I've gone to the Hoover Dam three or four times over the past four years, and each time marveled at the new construction. The bridge grew outwards from the canyon walls, dangling from humongous cranes and tension cables. the Dam itself is already tall and imposing, a massive concrete wall wedged into a big canyon. But now, two engineering wonders sit side by side, each providing a spectacular view of the other. Mostly, I'm excited because it's rare to see something so practical take on such a beautiful form. 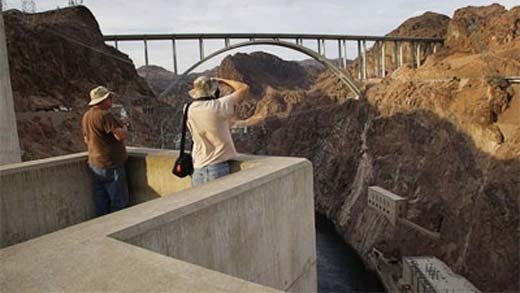 This bridge will cut the trip to Phoenix or the Grand Canyon's South rim by an hour or two. On certain trips, I've driven 60 miles out of the way on the 95, in order to avoid traffic and huge delays on the 93. I'm really hoping for a boost in tourism from Arizona. The Hoover Dam has grown on me since I've been living here. The more I know about its history, the better I like it. When I discovered the Railroad Tunnel trail, the better I liked it. Each time I go, I get more out of it. Plus, I really like heights. So, when this bridge opens officially in November, keep an eye out for me. I'll be there.